Sea level and boat traffic are both on the rise in San Francisco Bay, and they are making big waves. But, rougher water in the Bay doesn't just make ferry rides more exciting. It also erodes our remaining tidal marshes, and fast. Tidal marshes in the Bay Area are receding, sometimes as quickly as three feet each year. These wetlands provide important habitat for endangered plants and animals, and may also be key defenses against sea level rise. Protecting the remaining undeveloped shoreline is a real challenge, but a team of ecologists and engineers in Marin County have tried a radical new strategy that seems to be working--they've engineered a beach. Aramburu island in Richardson Bay is a small man-made island built in the 1960s with waste materials from canal dredging and home development on nearby Strawberry Point. In the last 45 years, the eastern shore of the island has eroded over 130 feet. Further erosion of the island might expose many Mill Valley homes to waves crossing the Golden Gate. 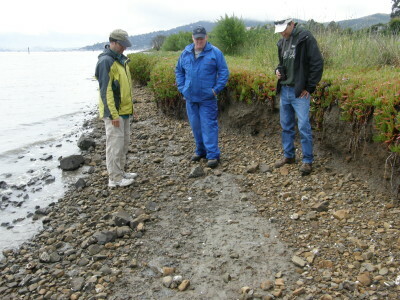 The team sought to engineer a new beach on the east side of Aramburu that would mimic the gravel barriers that naturally fringe tidal marshes in the area. But rather than design the island to very precise specifications, the team wanted to build a more resilient beach that could stand up to natural processes. 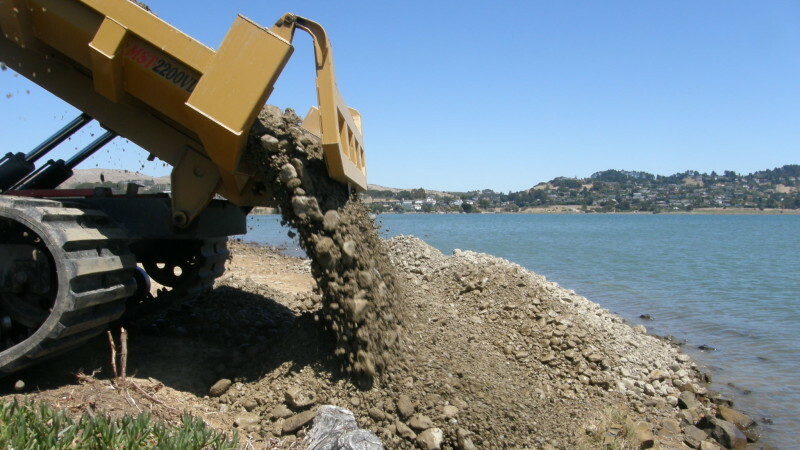 “Self-assembly was really the construction premise: we feed the beach the material it needs, and then [the ocean] moves it around to the right places," explained Peter Baye, an ecologist who co-led the project design, along with Marin county engineer Roger Leventhal. So, in the summer of 2011, they started cutting back the eroded, unstable slopes on the island's east side. They built a ramp with gravel, sand, oyster shell hash,and eucalyptus logs, most of which were recycled waste from local sources. The size and shape of these materials closely matched the Bay's natural beaches, where coarser items like larger rocks and driftwood help trap finer sediments. They then let nature take its course to reshape the materials into complex beach features along the shoreline. They also removed the weeds that had overrun the island and replaced them with over 36,000 native, salt-tolerant plants. Four years later, the results have exceeded expectations. The rapid erosion of the east side of the island has stopped, and the Bay's first engineered beach is holding up against winter storms and continual increases in waves. New tidal marshes, meadows and salt flats have also burgeoned along the west side of the island, and this new habitat has attracted huge numbers of birds. Since 2011, the number of birds observed on the island has nearly doubled. 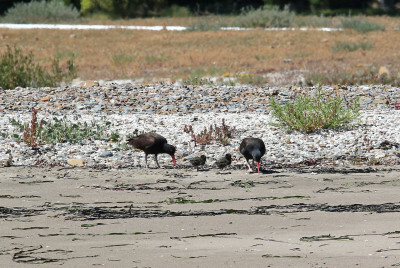 "It's created beautiful new beaches, which are perfect habitat for resting shorebirds and waterbirds," says Kerry Wilcox, the Waterbird Program Manager at the Richardson Bay Audubon Society. 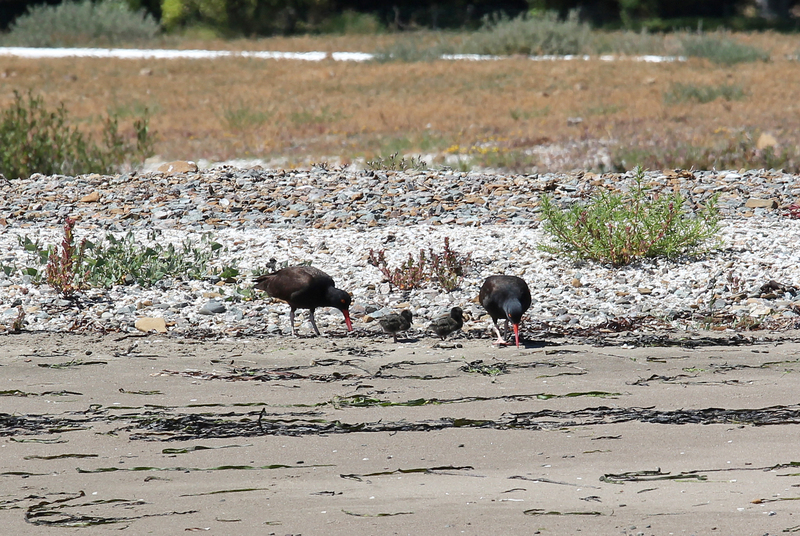 "In fact, we've even seen successful nesting of black oyster catchers for the first time ever, as far as we know, in this part of the bay." "It's a little out of the box," says Katharyn Boyer, a biology professor at San Francisco State University, who was not involved in the project design. "A lot of people like me are really watching closely to see how this goes," she adds, "but I think it's proving to be an excellent model for the future."